The Qing dynasty emperor Qianlong (r. 1736–95) commissioned this jade boulder, apparently the largest piece of historic carved jade outside of China. It depicts a literary gathering of scholar-officials at Lanting, the Orchid Pavilion described in “Lanting jixu” (Preface to the Poems Composed at the Orchid Pavilion), by Wang Xizhi (303–361), recognized as the greatest calligrapher of the Far East. The prose itself is carved on the front. Wang Xizhi, together with forty-one other renowned scholar-officials, gathered at Lanting and engaged in a drinking contest: wine cups were floated down a small winding creek as the men sat along its banks. Whenever a cup stopped, the man closest to the cup was required to drink it and write a poem. In the end, twenty-six of the participants composed thirty-seven poems. 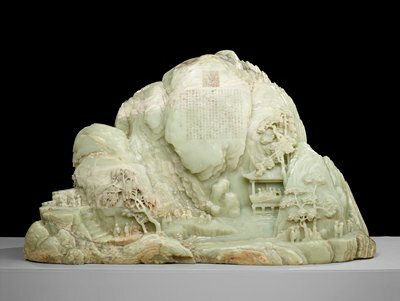 Emperor Qianlong’s own poem appears carved on the reverse. Artist Andrea Carlson on the unspoken history, unseen stories, and awkward moments behind her Mia project "Let: an act of reverse incorporation"